Kate has been unusually cheerful the past two weeks. Yesterday was different. It’s not that she was in a bad mood. She just wasn’t especially cheerful. Getting her up earlier than usual may have had something to do with that. On the other hand, it may have been one of those things that we can never explain. We had a busy day that started with my appointment for labs prior to seeing my doctor next week. Until the past year, I have always had the earliest appointment I could get. Since Kate sleeps later than she used to, I have changed to 11:00. That is still early for Kate, but I am eager to eat as soon as I am up. I woke Kate at 9:15 in order to give her time to get ready without rushing too much. It was one of those days when she didn’t want to get up. She told me to go on without her. I told her I didn’t want to leave her alone. I apologized for getting her up and explained the reason. She still didn’t get up. I asked her to do it for me. She agreed and did so well getting ready that we had time for a quick stop for a muffin at a Panera not too far from my doctor’s office. From the doctor’s office we went directly to lunch with one of our associate pastors. We had a nice time, but Kate was not very talkative and cheerful. She actually snapped at me as I offered my hand to assist her in getting up as we were leaving. She had a hangnail on her left thumb and thought I was going to grab it. It was a nice lunch, but Kate wasn’t at her best. We had a couple of hours before taking her for a massage. She rested at home most of that time but got up easily when I told her it was time to go. The past couple of times she has said she didn’t want to get a massage. This time she didn’t say a word. She went happily. Two weeks ago when she had her last massage, I talked with one of the staff in the front office. I told them I thought we might be coming to the end of her massages. I told them I would like to try at least once more. We talked again this time. Kate had been so accepting that time, I thought it would be good to try again. I scheduled yesterday’s appointment. When I went back to pick her up, I waited a few minutes. Then the woman who gives her the massage came out and told me that they had finished, and she had left Kate to get dressed. When she went back, Kate was lying down on the table and had not dressed. I went back and helped her. She was confused. I don’t think she realized that she was supposed to get dressed. When she was ready, we walked back to the front desk where I discreetly cancelled the next appointment. I don’t plan to schedule any more. The highlight of the day came when we returned home. Kate noticed the photo of her and her brother on the cover of her “Big Sister” album and said, “I just love that picture.” She commented on the smiles of the two children. I said, “Do you know who they are?” She did. I asked if she would like to look through the book. For the next hour we went through most, but not all, of it. She expressed more enthusiasm than she had all day. I continue to find mystery in the way her brain works and doesn’t work. As we looked at pictures of her family, she sometimes recognized her mother, father, and brother. Other times, she had no idea who they were. Often she looked at two pictures of her father that were side by side on the same page. She asked, “Who is he?” I told her, and she asked, “What’s his name?” I told her. Then she looked at the other picture and asked the identical questions. We went through the book for an hour repeating these questions and answers. Of course, some of the confusion involves the fact that the way people look changes significantly over time, but the big problem is Alzheimer’s. I’m just glad she had that hour to really enjoy herself. Last night we went to Casa Bella for jazz night. That is always a hit. She enjoyed it, but the experience wasn’t as good as usual. We always sit with the same couple. Often no one else joins us. If so, it’s just one other couple. Last night we were at a table with seven other people three of whom we hadn’t met before. This made conversation a bit more challenging. Kate was quieter than usual. She enjoyed the music, but I am sure she was uncomfortable in the larger group. Looking back, it wasn’t a bad day at all. It just wasn’t like the ones we have had recently. Most days are very good. I’m sure we will have many more in the days ahead. Kate’s celebration of Valentine’s Day started late in the afternoon on Wednesday when a high school student and neighbor of ours delivered a dozen red roses to her. The young lady had called me several weeks ago to let me know she was selling roses as part of a fund-raiser at her school. When she arrived at our door, I invited her in to give them to Kate. I realized the likelihood that Kate would think the roses were from the girl but didn’t tell her otherwise. She responded with enthusiasm and appreciation for her thoughtfulness and gave her a big hug. After she left, Kate selected a spot in the family room where she put them. Yesterday morning she had long forgotten the girl and the flowers but she saw the roses on the table. I told her they were from me. I got the same enthusiastic response and hug, and she got to celebrate the same present twice. She lived the whole day without recognizing that it was Valentine’s Day except in the moments when someone would mention it, but it was a day filled with nice moments. At lunch, our server took time to show us a picture of his three-year-old daughter dressed up for Valentine’s Day. He is from Romania where they celebrate “Name Day.” He explained that his daughter’s name is Valentina so Valentine’s Day is really special for her and her parents. Kate loves children and was delighted seeing his daughter’s photo. She wouldn’t remember, but we met the mother and daughter one other time when we had lunch there. As we were leaving, we walked by a table where two grandparents were celebrating the day with their new grandbaby. Kate had to stop and comment on her and how beautiful she was. We had a brief but pleasant conversation with them and then left for home. At 2:00, Kate had a massage. I still don’t detect any sign that she thinks having a massage is special, but it seems to me that she must derive some immediate pleasure from it. There is always some turnover in the staff, but she has only had to change massage therapists once. We come often enough that the rest of the staff knows her and watches out for her. When I first started taking her, the staff let her walk out. When I arrived, I couldn’t find her. Then I saw her walking along the store fronts in the shopping center where the spa is located. After that I have made sure that all the staff is aware of her Alzheimer’s. I also take my laptop or iPad and walk a few doors down to Whole Foods where I wait. Then I go back about five minutes before she is ready. We’ve had no problems since. We hadn’t been home long before a church friend stopped by to visit Kate. When Kate served as the volunteer church librarian, the two of them went out to lunch regularly. Her husband had Lewy Body Dementia, and she has been good about checking in on Kate since he died a few years ago. They visited for over an hour without a break in the conversation. I was in the kitchen and couldn’t hear what they were saying except when Kate called me in one time to help her answer a question and also when her friend was leaving. I heard enough to know that she was handling herself well. She can’t recall specific facts, but she can express her thoughts about education and children and many other things. This reminds me that even at times when she doesn’t know my name or that I am her husband, she does remember my personality. She regularly surprises me with the accuracy of her perceptions of me. Last night we went to a Valentine’s dinner at Casa Bella. They didn’t have music this time, but we were seated at a table for four with the 94-year-old couple with whom we always sit on music nights. On those nights we have six or eight people at our table. That makes for a different kind of experience than last night. Larger numbers of people create more difficulty for Kate. Sitting with this couple we like so much was a real treat. They are both in remarkably good shape. He is the oldest living Hall of Fame basketball player at UT. I’ve always been impressed with his memory and learned last night he has a photographic memory. We had a pleasant conversation throughout the dinner. Even Kate got into the act. The couple is aware of her Alzheimer’s. Even if they hadn’t been, they would have suspected something. A number of times she was unable to follow the conversation and asked questions that she should have known from what had been said previously. She also got wound up talking about her school experience. This is one of those occasions she didn’t stick to her feelings but communicated what she was reporting as fact. She reported things I knew didn’t happen or that she could not have remembered. She also interrupted the man several times to continue talking after he had started talking about something else. They are very understanding and no harm was done. It was a nice way to end Valentine’s day. I hope we’ll be able to enjoy their company for much longer. Since they are 94, and Kate is already in the late stages of her Alzheimer’s, the end may come sooner than I want. Like everything else, we will continue to enjoy these moments as we experience them and be grateful. I guess I was so happy about our previous day that yesterday’s posts didn’t mention that Kate showed almost no signs of a cold. Wednesday was her best day in the past two weeks. I was relieved that we had avoided anything more serious. Yesterday she was even better. It was the second day in a row that she got up early, took a shower, and went back to bed. This is a time when I could have let her stay in bed longer, but I wanted to have lunch with her before the sitter arrived. I was glad I did. We had a nice lunch and were back home in time for me to set up the TV in our bedroom with YouTube videos. I chose Andrea Bocelli. I also showed Mary how to search for other videos if they wanted something else. Kate said she wanted to rest a while and got in bed. While I was at the Y, I checked the video cam several times. Each time they were still in the bedroom watching videos. The same was true when I returned home four hours later. Kate had been up a while and was fully engaged with the music. So was Mary. Setting up the TV for YouTube or DVDs before I leave has become a regular thing now. That seems to have replaced their afternoon trip to Panera. I still mention the possibility of their going to Panera, but Kate isn’t responsive to that. Yesterday was an exception. She was excited about going but wanted to rest first. After resting, she only wanted to watch Bocelli. Because my primary focus is on Kate, I don’t say much about other things I do while the sitter is here. Of course, I have my Monday Rotary meeting and my trip to the Y on Monday, Wednesday, and Friday, but I also meet my friend Mark Harrington every Friday afternoon at Starbucks. We hadn’t met the past two weeks because of Kate’s cold. In both cases, I had forgotten to let him know I wasn’t coming. That’s just one of the things I discover that I have slipped up on lately. I find more things slip through the cracks than they used to. I know some of that might have occurred just because of my age, but I feel sure that my responsibilities for Kate also play a large part. Anyway, it was good to see Mark again. He’s an interesting man, and we always have a lot to share. He is the one who takes care of the technical issues in connection with the blog. Right now he and I have been working on a book I am editing. The first half consists of three and a half years of emails that I wrote under my dad’s name after his stroke that left him unable to use his computer. The second half is devoted to over 100 pages of Dad’s own biographical notes that he had written for a writing class he attended several years prior to his stroke. We’re close to printing time now. When it is finished, I plan to give copies to the family and a few close friends. That would have happened long before now if I hadn’t found it difficult to work in with my other responsibilities. Every few weeks I also meet with a church friend whose daughter was diagnosed with frontotemporal dementia in her fifties. We met for coffee Wednesday afternoon. Our experiences are vastly different. Talking with him underscores how fortunate Kate and I have been not to have other complicating factors beyond the illness itself. Despite our differences, we also have a lot of common experiences. I enjoy being with him. I hope our lack of complications don’t make it less enjoyable for him. While we were out for our Friday night pizza, we bumped into one of my long-term clients and his wife. They sat down with us and chatted about forty-five minutes. It was good to catch up with them. Kate also enjoyed it. These experiences continue to reinforce my belief that the primary benefit of eating out is that it is a social occasion. Most importantly, it is the type of social occasion that Kate handles quite well. The time is short. We exchange pleasantries and are on our way. It is good for her and for me. For the second time this week Kate did not recognize me when she woke up. These occurrences come only days after my saying that she almost always recognizes me as someone she knows and trusts. That is still true, but it makes me question my optimism as to how long this will last. As I have seen so often, this failure to recognize me came with a mixture of other signs that she sensed more familiarity than her rational ability could express. She didn’t display any sense of surprise when I walked into the room. She appeared to respond to me as she normally does. Then she said, “Who are you?” I said, “Do you recognize me at all?” She said she didn’t, and I gave her my name and told her I am her husband.” She seemed more puzzled than usual by this news. She didn’t recognize either my name or that I am her husband. At that point, I decided not to make this a point of discussion. I was confident that with a little time she would put it all together. I suggested that she get up and let me take her to lunch. She responded the way she always does and got up. She let me help her dress. She went to brush her teeth, and I went to the kitchen. In a few minutes, I heard her say, “Hey, where are you?” That, too, is very normal. She doesn’t know her way around the house and looks to me to tell her where she should go. As I walked toward the family room, I said, “I’m in the kitchen.” She was standing in the doorway coming into the family room from our bedroom and saw me. We went back to the kitchen where I had her morning meds waiting for her. When she had taken them, I picked up our iPads and cups and we left for lunch at Panera. While waiting for our order, she asked my name. I told her and said, “I am your husband.” She seemed puzzled and asked how long we had been married. I told her. She didn’t question me. Instead, she asked me her name. That led to her asking if we have children. When I told her, she wanted to know their names. That led to further conversation about our marriage. I told her we had had many good times during our marriage. She agreed and asked me to tell her some of them. After that, I didn’t see any obvious signs that she didn’t know me. We stayed at Panera about an hour and a half and then returned home where Kate rested almost two hours. Then we went back to dealership to pick up my car that I left the other day. When the service rep walked us to our car, I walked directly to my side. Normally, I would have opened the door for Kate and helped her get settled in with her seat belt. Before I got in the car, I looked back and she was standing at the rear of the car waiting for me to tell her where to go. It is very common for her not to know which side of the car she should use. I know this but had fallen down on the job. I walked her to the passenger’s door. Once she had gotten in she didn’t know where to put her cup. The service rep was waiting for me at the driver’s door. She is the same one I had given my first “Alzheimer’s card” two days before. If I hadn’t already given her one, I would have this time. There was no need now. She understood. Last night was Broadway night at Casa Bella. Kate’s confusion continued. She was seated beside the woman whose mother started the restaurant almost 79 years ago. We sit with Signora Rizzo and her husband for all the music nights. We hadn’t been there too long before Kate leaned over to the Signora and said, “What’s the name of this restaurant?” Everyone at the table is aware of Kate’s diagnosis, and Signora Rizzo responded beautifully. She told Kate the name of the restaurant and that her mother had started it. She also gave her a little of the restaurant’s history. Kate was surprised and interested in what she had to say. I’m not sure why, but it took longer to get our meals last night. Several times after we had ordered, Kate asked me if we had ordered and when we were going to eat. Finally, she said, “Does this place serve food?” Signore Rizzo, who was seated beside me, said, “I was wondering the same thing, Kate.” We have always enjoyed sitting with this couple. The way each of them responded to Kate last night is consistent with the kind of people they are. I hope we have many more music nights together. These little public incidents of Kate’s confusion are trivial. No one was embarrassed or disturbed, but they do make me wonder what lies ahead. About a week ago, I mentioned ordering small cards with a message that I could discreetly give to people in a public situation. 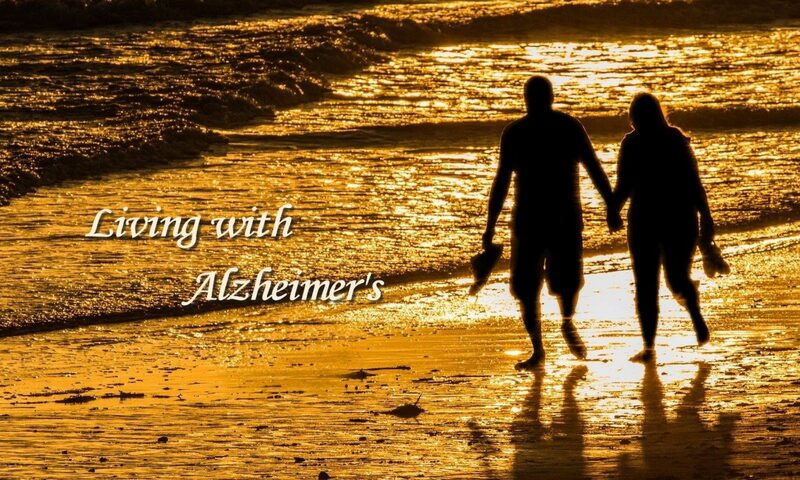 The message says, “My wife has Alzheimer’s. Sometimes she may say or do something unusual. Your patience and kindness are appreciated.” This afternoon we took my car to have it serviced. On the way, Kate noticed a TCU alumni magazine on the floorboard of the passenger side. She had left it there on a previous trip and hadn’t remembered seeing it at all. While we were in the office, the sales rep from whom I had purchased my last two cars walked in to say hello. That led to a brief conversation about new cars and the new safety features, specifically the indicator that lets you know when a car is in your blind spot. Kate didn’t understand and asked, “What in the world are you talking about?” We tried to explain, but she couldn’t understand “blindspot.” When the service rep took us to our loaner car, Kate seemed confused about which side of the car she should get in. I felt this was a perfect time for such a card. I took one out of my wallet and handed it to the service rep and took Kate to the passenger’s door. When I returned to the driver’s door, the service rep gave me a smile of acknowledgement. I wonder how many of these cards I will distribute. Last night was opera night at Casa Bella. We sat at our usual table with the couple who used to operate the restaurant before their daughter and her husband took over. A new couple joined us. We were seated with the three women on one side of table each one across from her husband. Kate and I were in the middle. The conversation was going on in several directions. At one point, Kate got my attention and asked me to tell her where we live. The woman to her right had asked her, and Kate didn’t know the answer. I said, “Knoxville,” but she wanted to know the part of Knoxville. I told her. The conversation continued. Then Kate wanted to know where she is from, that is, her original home. At that time, the person to her right was talking diagonally across the table to the person on my right. I looked at Kate and asked her to wait just a minute in order not to interrupt them. Kate was frustrated. When she wants something, she wants it right then. In a loud voice she said, “Richard, where am I from?” It wasn’t loud enough to be heard around the room where the rest of the crowd was involved in their own conversations; however, it was obvious to each of us seated at our table. I told her Fort Worth. Since the man to my left had a friend in Fort Worth, that opened another conversation. We went on without showing any sign of Kate’s outburst. It would have been a good time for one of the cards I am having printed just for this purpose. They will arrive sometime next week. That’s good. We could be reaching the time where they might come in handy. Some things work out without much effort on my part. Although I try to avoid or minimize making any morning obligations, I have not eliminated them entirely. One of those occurred last week when I had to go for my labs at the doctor’s office. Another occurred yesterday. I had made plans to take Betty Shiffron, a church friend, to see La Traviata at one of the Live in HD at the Met performances. Kate and I usually eat at the Bluefish Grill on Saturday, and it is short walk to the theater. The last time we did this was in the spring just before Kate began sleeping so late in the morning. I told Betty we would pick her up shortly after 11:00 unless Kate were having any trouble getting up. I was concerned that I might have a problem, so I decided to start early. When I went to the bedroom around 9:00, I found that Kate had already gotten up. From there it was smooth sailing. We even had enough time to get her a muffin at Panera before leaving for Betty’s house. We had a very pleasant lunch although it seemed to be a more challenging experience for Kate than I expected. She wanted to be engaged in the conversation but had trouble understanding what we were talking about and remembering things we had already said. Quite a few times, she said things like, “Who are you talking about?” or “What are you talking about?” It didn’t present a problem for Betty and me, but I felt sorry for Kate. Betty is not as accustomed to being with Kate and is not as sensitive about her difficulty following conversations. It was a “sink-or-swim” experience for Kate. The Live in HD at The Met performances significantly increased Kate’s enjoyment of opera. Although we had attended operas before then, I think she went more for my benefit than hers. Seeing opera on the big screen with the camera work that brings the viewer up close has made her enthusiastic. She has changed a lot since the spring, and I wondered how she would respond. Several years ago I had a “walk-on” role in La Traviata when a European opera company came to Knoxville. In addition, Kate and I attended a performance of the opera in Zurich during our last international trip in 2015. I didn’t expect her to remember the opera, but I did hope that she might recognize some of the music. She did enjoy the music, but the overall experience was not what I had hoped. She was very confused about what was going on. During the first intermission, she wanted me to explain it to her. It was simply too complex for her to grasp. This was a good illustration of the fact that the intuitive” part of her mind still values “rational” thinking. I had wanted her to focus on the music which I knew she could enjoy and not worry about the plot and precisely what was going on. This is not something that is new at all. That is what is behind her efforts to know people’s names, where she is, and what they are saying on the news. It is easier for me to let go and let her enjoy life through her intuitive abilities than it is for her. Situations like this are good reminders to me that there is an intersection of the rational and intuitive processes. After the opera, Betty wanted to take us to get ice cream. When we entered the shop, there were only a couple of open tables. I took Kate to one and asked her to stay with the table while we ordered. While we were in line she left the table and approached us. She never went back to the table. I’m not sure whether it was a result of confusion over what I had asked or that she felt more secure being near us. I think she was confused. I do know that she frequently is confused by almost any instruction she is given. Similarly, at dinner I asked her to take one of two tables while I went to the counter to order. She wanted to go with me. When we walked to the counter, she wanted to go to a table. This is also a common occurrence. At one moment she wants one thing. The next she wants something else. Despite these things, we had a very nice day. Being with Betty was also good for both of us. She is 90 and quite fit and very active. She is also a big talker and speaks quickly. She also walks quickly. It was a good finish to a week of social and musical experiences. It began with a scream and ended with music. About 4:30 yesterday morning, I was awakened with a loud scream. Kate had a bad dream. She was unable to tell me about it but was very frightened. This was a time to comfort her. I held her and told her she was all right, that she was safe and that I would take care of her. She calmed down and dosed off within fifteen minutes. This was not the first time she has had a bad dream. Fortunately, they don’t happen often. Most of the dreams I have been aware of have been good ones. Until the past couple of years, she would talk while dreaming. They were always in a situation in which she was teaching children. I could easily see this as an outgrowth of her years as a school teacher and librarian/media specialist. I stayed in bed until 5:10. I decided to let Kate sleep. She had responded so well to Valorie’s getting her up, showered and dressed last week that I felt comfortable letting her take care of her again. Before leaving, I told Kate I was going and that Valorie would take care of things. She seemed perfectly comfortable with that, and I left feeling good. When I returned later in the afternoon, Valorie and Kate were in the family room having a serious conversation. They were talking about students and teaching. At least Kate was. Valorie appeared to be listening. I was pleased to see they were getting along well. They were talking as two friends might do. I am still surprised, but glad, that Kate is willing to let her help with her shower and getting dressed. We ended the day with an annual Christmas dinner with music at Casa Bella. It was a wonderful evening. The meal was outstanding, and the conversation lively although it was hard for Kate to keep up. She couldn’t hear or understand much of what was being said. She frequently asked me to tell her what people had said. As I have been doing lately, I cut her meat (a very tender beef tenderloin) for her. That is something new within the past couple of weeks. This was another bitter sweet occasion for me. I can’t predict the future, but I know that next Christmas will be very different from this one. I am glad that it went well. Kate and I both loved the music, and we ended the evening singing Christmas carols. We don’t know most of the sixty or guests who were there, but we are accustomed to seeing them for these musical nights throughout the year. It was a beautiful shared experience for everyone.